A closer inspection of your car underside will reveal a series of tubes running from the engine to the backside of the car. This is the exhaust system. It is critical for expelling hot waste gases from the combustion chambers. From the catalytic converter, you go to the muffler and then the exhaust. Mufflers are used to reduce the noise that goes through the exhaust. They do this by allowing the gases to expand slowly. Exhaust pipe muffler temperature is usually between300 to 500 degrees, but they are also known to handle higher temperatures of up to 1200 degrees. Extreme exhaust temperatures can destroy the catalytic converter. While the average temperature for the exhaust is 300 to 500 degrees, you still can experience temperatures as high as 1200 whenever there is a constriction in the exhaust system. You should be on the lookout for bends on the exhaust pipe. Due to contact with other cooler parts of the car the exhaust gets an opportunity to cool down. The catalytic converter often reaches a temperature of 750 degrees. However, if you have more of unburned gases leaving the combustion chamber or one of the cylinders is not working you will experience a tremendous increase in temperature. The exhaust pipe muffler temperatures reach their peak when the car is on the road rather than when it’s idle. This is due to the high rpm; however, temperatures can also rise due to inefficient combustion of gases. You can use an exhaust gas temperature gauge to measure how hot the exhaust is. Use the device with an oxygen sensor. To understand exhaust pipe muffler temperature you need to understand how the exhaust system works. The system consists of the exhaust manifold, resonator, catalytic converter, muffler, exhaust pipe, and tailpipe. The process of eliminating exhaust gases starts at the exhaust manifold. Here the gases from the combustion chamber are removed from the engine into the exhaust pipe. The manifold is made of cast iron, and this enables it to handle the hot gases. The catalytic converter is next; its purpose is to remove any harmful emissions from the exhaust gases. This is done through a series of metal catalysts made from platinum palladium and aluminum oxide. The catalyst reacts with the hot gases, and this removes hydrocarbons and carbon monoxide from the exhaust gases. The by-product is carbon dioxide and water which is less harmful to the environment. Similar to the muffler is the resonator. Its work is to reduce exhaust pipe noise. The resonator is filled with sound muffling materials. A series of pipes connect the different parts of the exhaust system. The muffler reduces exhaust noise through a series of baffles. Here sound waves are bounced back through the baffles, and this causes it to lose its power and wavelength. Other cars may have a muffler made from fiberglass, or sound observing materials. The last part of the exhaust system is the tail pipe. This is the part that extends outside the car; it releases the exhaust gases into the environment. The exhaust system helps to control the release of harmful gases to the environment. Some of these include Sulfur dioxide, hydrocarbons, carbon monoxide, lead, nitrogen oxide, and phosphorous. One of the leading causes of malfunctioning exhaust systems is rust. The exhaust often comes into contact with water elements and when combined with the hot gases can lead to corrosion of the system. This problem often presents itself in the muffler where the exhaust gases are not hot enough to vaporize water deposits. This problem is more seen in areas experiencing high rainfall and snow. If you have been driving a lot off-road or encounter potholes, it can cause strain on the exhaust system causing lose parts. This lose parts put further strain on the muffler, and with time it can come off. What signs should you look out for in a faulty exhaust system? Loud exhaust: the very first thing you will notice when you have a faulty exhaust system is that it makes a whining sound. This becomes worse when you are driving. The problem could be that your muffler has developed cracks. 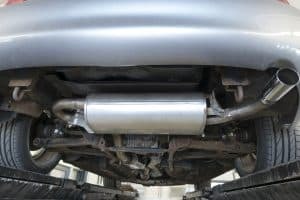 If not taken care of immediately the problem could extend to other exhaust system parts like the catalytic converter, which leads to further engine problems. Low fuel efficiency: Whenever you experience problems with your exhaust system, you will start to notice that your car consumes more. Fumes are leaking into the car: an efficient exhaust system will expel exhaust gases through the tailpipes. But, when you notice fumes coming into the car, then you could be leaking. Exhaust gases are laden with carbon dioxide, which could cause health problems to the car’s occupants. 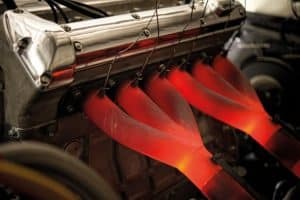 Condensed exhaust pipes: once exhaust gases leave the catalytic converter they are turned into carbon dioxide and water. This water when it condenses in the muffler can cause it to rust which will lead to further leaks. Once you start noticing some of these signs, it is prudent that you take your car to the mechanic and avoid further damages. Your gas consumption can increase, and the sound of the exhaust can be embarrassing. The exhaust system plays a crucial part in eliminating exhaust gases from the engine. The air/fuel mixture after combustion produces harmful byproducts that can harm the environment. This is the reason the exhaust system comes with the catalytic converter that captures these gases leaving carbon dioxide and water. The exhaust pipe muffler temperatures can be extremely high – sometimes reaching 500 degrees – but the exhaust system is well capable of handling temperatures of up to 1200 degrees. It is vital that you have your exhaust system checked the moment you start hearing a whining sound accompanied by increased fuel consumption. The muffler can rust due to water condensation, later developing cracks. Leaking carbon dioxide fumes can be harmful to car occupants, and that is why you should have your exhaust checked immediately. Understanding the functions of each part of the exhaust system is vital when you are thinking of making modifications.